Toronto’s Waterfront Transit Reset planning has been underway since 2016, and most of the decisions about routing were settled by early 2018. Retaining the streetcar link with an expanded loop at Union to provide greater capacity and an underground junction at Queens Quay leading to the Waterfront East line. Replacing the streetcar operation am “automated people mover” (now “APM”, but originally called a “funicular”) using two linked trains, one in each tunnel, and an expanded station at Queens Quay. The APM trains would be linked by a cable that would move the cars, and they would have no on-board propulsion. When one train is at Queens Quay, the other would be at Union. Replacing the streetcar operation with a pedestrian walkway and moving sidewalk from Union to Queens Quay. In the two latter schemes, the original idea was to keep the streetcars on the surface at Queens Quay with links down to a station below. The walkway/moving sidewalk option was discarded early in the process because there was not enough room for a bidirectional ramp (akin to what used to be at Spadina Station) and walkway, and a unidirectional ramp would pose accessibility problems. 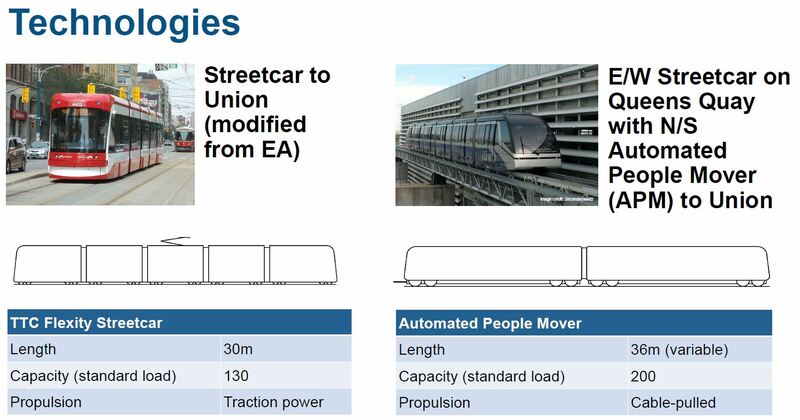 Two technologies remained – streetcar and automated people mover (APM) – for the tunnel with sub-options for the interchange between APM and streetcar. the need for an outdoor transfer connection. For both remaining schemes, an underground station would be required at Queens Quay although the design would vary depending on whether the streetcar or people mover option was selected for the Union link. 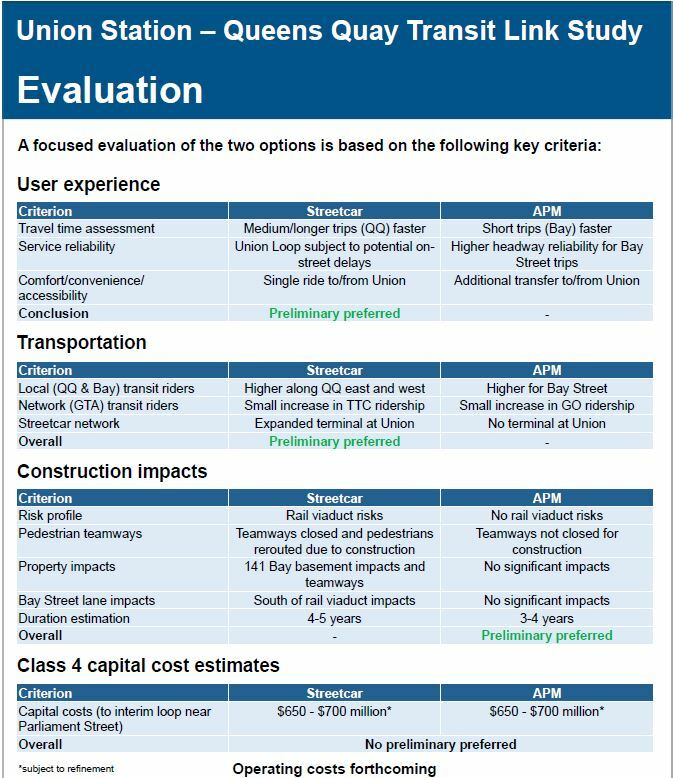 The two options were evaluated for various factors including user experience, overall network benefit, construction effects, and cost. On balance, the streetcar option won out, and the people mover option was not as simple and cheap as its proponents had thought. The one criterion on which the PM did rank better was construction difficulty. This recommendation will go to Toronto’s Executive Committee, the TTC Board and Council in April along with reports on other major projects including SmartTrack and the Scarborough Subway Extension. How much attention the Waterfront will get in the midst of debates on larger projects remains to be seen, and of course there is always the problem that available funding falls far short of paying the bills for every project on the table. Toronto talks a good line about “transit first” development, but never puts up real money. The waterfront is always a project for some indefinite future time, but not now. As a city, we love new buildings and crow over the number of cranes in the sky, but we assume that travel demands these buildings create will magically flow over the existing network. On a regional scale, this has delayed needed growth in GO Transit and the Relief subway line, and on a local scale it limits transit growth to a handful of very expensive subway extensions whose value is counted first in votes. Development at a scale many parts of the GTA can only dream of will occur within a few kilometres of Union Station, and there is a great danger that transit will not be ready as buildings come on stream. The Waterfront East LRT (streetcar) is a years-overdue project. Development marches east from Yonge to the Don River along Queens Quay while transit service amounts to a handful of infrequent and unreliable bus routes. I strongly support the LRT plan, and participated in various advisory groups at Waterfront Toronto and the recently disbanded Sidewalk Labs Mobility Advisory Committee with the hope of seeing the LRT project come to life. Toronto as a city talks a good line about “transit first” in the waterfront, but does nothing to support this. There is always some other project more important. During the early days of SmartTrack, there were even claims that it would make the Waterfront East LRT unnecessary. That was complete balderdash, along with claims that ST would replace every other project, including a Relief subway line. The most contentious part of the Waterfront Reset has been the link to Union Station. One might think that simply expanding platform space there would be the obvious solution, but there are competing interests. Some residents and other activists argue for a surface LRT straight through the Bay & Queens Quay intersection to the eastern waterfront, while the existing Bay Street tunnel would be repurposed for various other technologies including a moving sidewalk or some form of “people mover”. For a while, Waterfront Toronto’s former CEO was pushing for a “funicular”, although the term is more applicable to transit routes on steep hills than in a relatively flat tunnel. The existing underground streetcar infrastructure, consisting of a ~540-metre long tunnel under Bay Street from Queens Quay Station to Union Station, opened in 1990. This existing link provides connections between the central-western waterfront, TTC Line 1, GO trains and buses, and the lower downtown core. The existing streetcar loop at Union Station is currently inadequate for present service levels, to and from the west only, because of its single, curved streetcar platform, on a single track, with insufficient space for present volumes of waiting and alighting customers, and the loop would not function effectively or safely if additional service from the east was added. Two designs were presented at a recent public meeting, but I did not report on them here as there are still many details to be worked out. Drawings for these options are not available online. Two new north-south tracks are added under Bay Street, one on either side of the existing structure. Platforms would be built beside these new tracks so that passengers would load and unload along straight segments rather than on the congested curve at the north end loop. 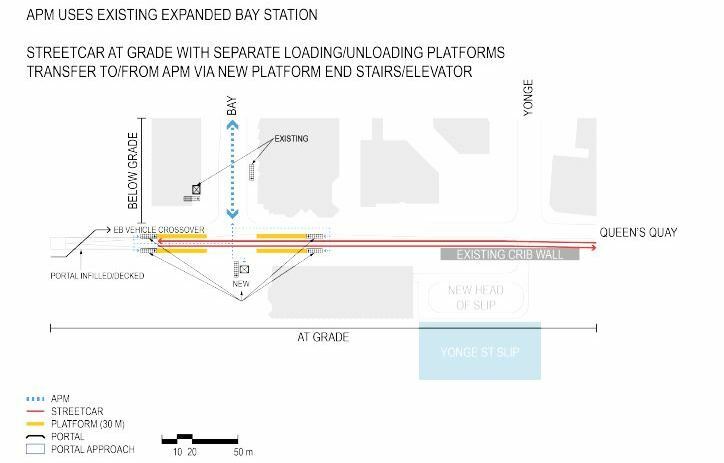 Two configurations are possible: in one all unloading would occur on the east (northbound) side with loading on the west (southbound) side, while in the other each side’s platform would serve one of the two waterfront routes. (For example, cars bound for Waterfront East could serve the east side platform while those going west stopped on the other side. The four-track structure would allow cars to bypass each other. The streetcar tunnel would be repurposed with a “People Mover” using one train in each half of the existing structure. Queens Quay Station would be substantially modified both as a southern terminus for the People Mover, and with a new underground LRT station. A surface option for this setup was dropped from the short list because of the volume of passengers who would be transferring between the PM and the LRT. 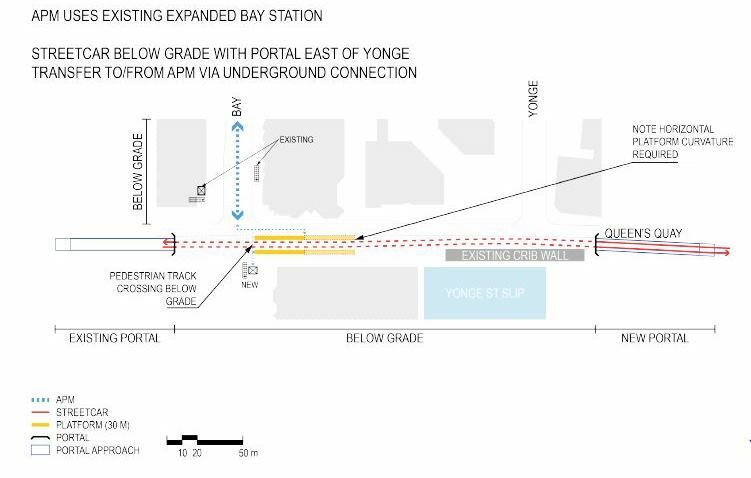 It is ironic that the impetus for removing streetcars from Bay Street came from the hope that the existing portal between Bay and York streets could be filled in, and that a new portal east of Yonge would not be required. However, the People Mover option, with its underground station, does not achieve this goal. The next public meeting of the Waterfront Reset project will be held in the Brigantine Room at Harbourfront, 235 Queens Quay West, from 6:30 to 8:00 pm on Monday, March 4, 2019. A third route into Union, the Bremner LRT, did not appear in the City proposals. It would, in any event, be impossible in the People Mover configuration. This proposal never made sense as Bremner is not wide enough to host an LRT route separate from Queens Quay West. A third service competing for platform space and track time at Union would make that interchange even more challenging than with only the west and east LRT services. City Planning could do everyone a favour by formally removing the Bremner route from their maps. This would also end a rather contentious debate about how a this route would affect the area west of Bathurst and south of Fort York. The Union loop should and could have been expanded during the extended shutdown of streetcar service for the reconstruction of Queens Quay West and the nearby work on GO’s Bay Street Concourse (to which the expanded loop will connect), but there was no political will to spend money on streetcars at Union. The Union Station connection will be the most expensive part of any upgrade to waterfront transit facilities, and this cost has been a drag on political decision-making. The Waterfront Reset is supposed to report to Council in April as part of an omnibus report on transit projects in Toronto. Once again, the waterfront could take a back seat to the favoured projects: SmartTrack and the Scarborough Subway Extension. This is the context in which Sidewalk Labs and their proposed Quayside development join the story. The Quayside site spans Queens Quay mostly between Sherbourne and Parliament Streets. What is quite striking here is the huge size of the Port Lands to the east and south compared with Quayside itself. [Map from Sidewalk Toronto website] The Port Lands are almost 30 times the size of Quayside and the same size as a large chunk of downtown’s business district. A share in any development there is a big prize. Waterfront Toronto took a different tack with invited bids for a futuristic centre where new technology would be at the heart of the Quayside development. This would not simply be another new set of condos on the water. The winning bidder was Sidewalk Labs, a subsidiary of Alphabet Inc. which is also the parent of Google. This company has very deep pockets. Sidewalk Toronto is their local presence. Original concepts for the area stirred both excitement and skepticism, but the debate quickly focused on technology issues related to invasive monitoring of activities at Quayside, the ownership of data collected, and the role of technology generally including autonomous vehicle (AV) technology from Waymo, another Alphabet company. Central to the Quayside proposal is the reduction of the carbon footprint both through building design (construction and operating effects) and by shifting much transportation demand to modes such as walking, cycling, shared vehicles and transit. 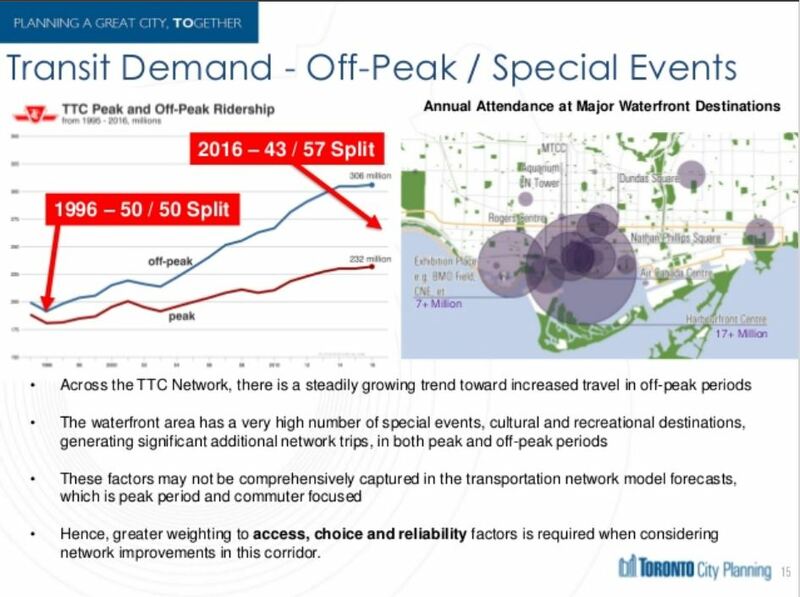 Transit is particularly important because the projected volume to and from the eastern waterfront exceeds 3,000 passengers per hour. The origin-destination pattern for these trips is not conveniently within the Quayside precinct, but spread over downtown. Incoming school and work trips originate even further afield. This is not a demand that autonomous vehicles can touch both for capacity and for reach of service in the foreseeable future, certainly not in the period when the waterfront will develop and be populated. For me, the Mobility Advisory Committee was a frustrating experience. There was a clear conflict between Sidewalk telling us about their wonderful technology and the committee’s ability to review and comment critically, if only thanks to time constraints, the number of committee members and infrequent meetings. There was far too much “sizzle” and far less hard detail, not to mention a sense that Sidewalk was rather full of themselves about their brave new technology world. The design for Quayside includes provision for AVs, and to some extent the proposed road layout was gerrymandered to increase the contiguous territory where AVs could operate without having to deal with a major artery such as Lake Shore Boulevard. A fundamental problem with any discussion of AVs is that Quayside is quite small, and most of the local trips within it would be taken on foot or by cycling. AVs might be handy for some journeys, but they would not be the backbone of travel because most trips started or ended well outside of the Quayside area. If AVs were going to have any meaningful presence in Quayside, the project scope had to expand, but how this would occur was not obvious until the Star’s revelation of Sidewalk’s and Google’s designs on the wider waterfront. A parallel and much more high profile controversy related to the data that would be collected by a very technologically active environment integral to the Quayside proposal. This is a transit blog and I will not delve into all of the threads that debate took, but the discussion served an unexpected purpose. With all of the focus on privacy and the integrity of personal data, other aspects of Sidewalk’s scheme and their wider designs faded into the background. The cynic in me suspects that for all that this might have annoyed Sidewalk, there was an advantage that the bigger picture of development scope and infrastructure funding did not receive the same attention, at least until the Star broke the story. There was always a nagging suspicion that the real prize for Sidewalk was the wider waterfront, but most discussions looked only at the comparatively small Quayside district. The problem with only reviewing that small precinct is that neither transit nor any AV scheme will rise or fall on the comparatively modest demand of one development district, but of the combined effect of building throughout the waterfront. A revised presentation was issued by Sidewalk, but it does not include some of the more contentious text cited in Oved’s article. The foundation of Sidewalk’s proposal is that they would not only finance infrastructure installation throughout Quayside and the Portlands, but that they would be repaid by tapping into future municipal revenues. They would not become developers, but would reap their reward as others built in the area they had serviced. This sounds promising if you are a politician accustomed to finding someone in the private sector to take costs off of your hands, at least in the short term. However, it is a form of borrowing just like any debt, and there is no indication of the return Sidewalk (or its funding parent, Alphabet) would expect on its investment. Moreover, there is a risk that economic circumstances will change over coming decades and development could slow or stop in Toronto. Would that risk be part of any deal, shared with Alphabet, or would they expect payment even for infrastructure supporting vacant lots? Development Charges are poorly understood in Toronto. They are levied city-wide against all new buildings, both residential and commercial, to recoup part of the cost of infrastructure upgrades. They are not site-specific, and buildings everywhere pay the cost of new infrastructure regardless of where it is needed. For example, new buildings downtown helped pay for the Spadina subway extension. (Provincial rules on the DC formula require that the portion of any benefit to existing properties be excluded from the calculation.) 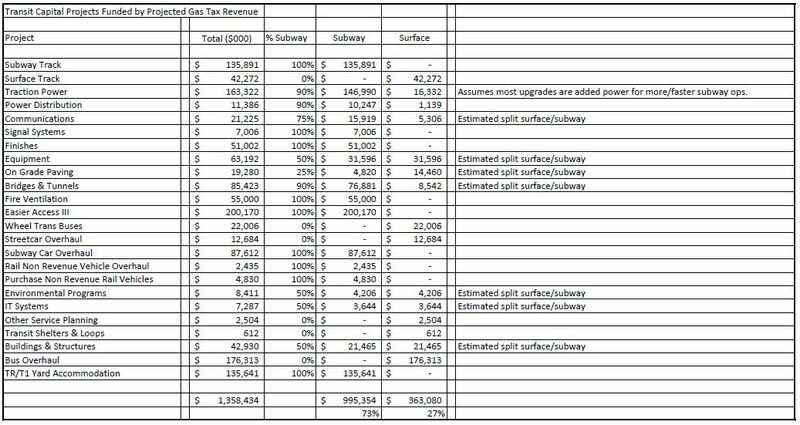 It is far from clear that the DC revenue from the Port Lands would be needed only to pay for infrastructure there. The idea of “Tax Increment Financing” (TIF) has been floated before and it was central to John Tory’s SmartTrack scheme. This something-for-nothing mirage has evaporated. We will now see the City investing substantially in new GO stations while having no control over the service provided to them or the fares charged. Indeed, some of the waterfront lands Sidewalk eyes for TIF benefits were likely also part of the original SmartTrack scheme. One can only collect a tax increment once, and one might even debate which of several projects (SmartTrack, GO RER, Relief Line, Waterfront LRT) contribute to the uplift in land values and taxes. The revenue streams Sidewalk seeks are municipal, and their proposal is silent on any investment from the provincial or federal levels. Waterfront Toronto, by contrast, is built on a tripartite arrangement with all governments, notably in its signature project the Don Mouth regeneration. If Sidewalk expects to be repaid for its contribution, where are the other “partners”? Looking more broadly, other financing entities might be interested in this project, and Sidewalk/Alphabet should not be given any preference. One way or another, the investment has to be paid back, and the affected governments will have to get the best deal (including possibly some self-financing) among whatever is on offer. “We don’t think that 12 acres on Quayside has the scale to actually have the impact on affordability and economic opportunity and transit that everyone aspires to,” Doctoroff said. This is not exactly news, but a great deal of “consultation” took place on the basis that only the 12 acres were under consideration. 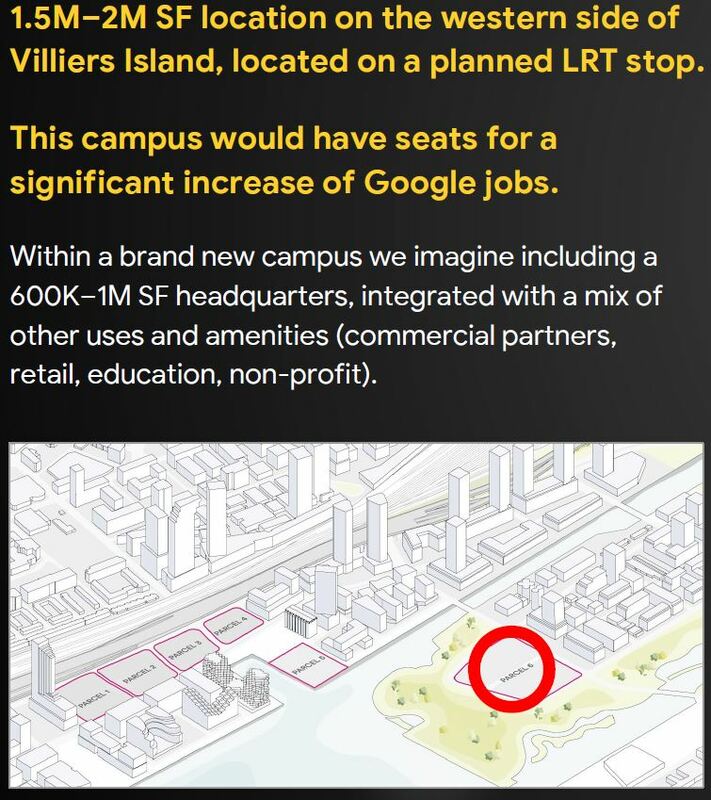 This would have an interesting effect on the initial size of Sidewalk/Google’s presence by placing a major employment node on Villiers Island. If Google/Waymo want a testbed for AVs, this would put their HQ firmly in the neighbourhood and would increase the initial scope of “AV territory”, although this requires that streets be “AV friendly”. One big concern about AVs is their co-existence with the LRT line. 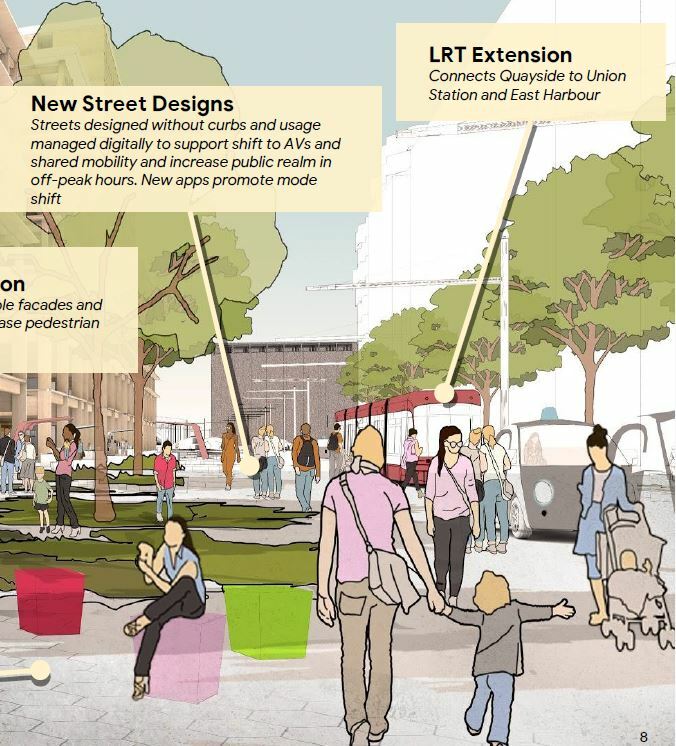 In an illustration of the new Queens Quay, an AV is clearly shown in front of a streetcar on the “LRT” right-of-way. Bad enough that there is a conflict with AVs stopping on the right-of-way, but with the expanded scope possible to serve the Google HQ, will Waymo expect to use the LRT right-of-way throughout the eastern waterfront? Would this be a condition of the contract for any financing of the LRT project? Sidewalk knows that the LRT is an important component of waterfront development. “This is something that is on nobody’s realistic drawing board. We would ensure it gets financed and all we want to do is get paid back out of the increase in value in terms of property taxes and developer charges that are only possible when that LRT gets extended,” said Doctoroff. 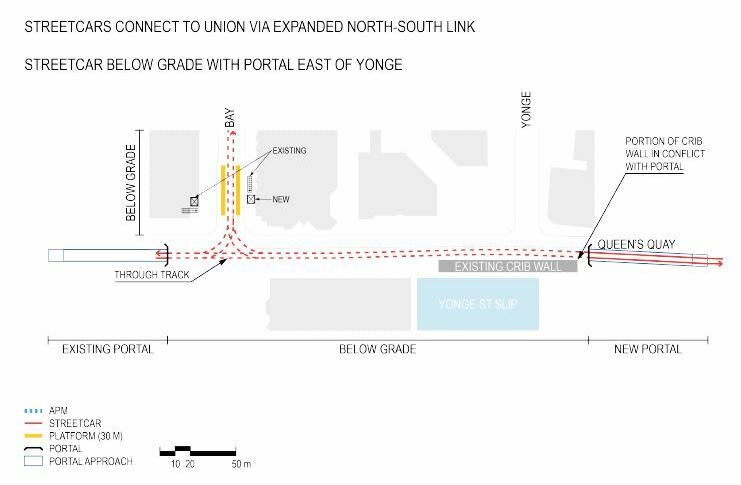 However, it is not clear how much of the LRT Sidewalk would actually finance, and if this were only the eastern end through Quayside, this could leave the critical link to Union Station in doubt. I cannot avoid the sense that Sidewalk has badly overplayed their hand, and in the process has compromised whatever discussions were in progress on their plans. One slide states there have been “weekly briefings with officials from the three levels of government,” and “regulatory dispensations,” have been drafted to allow the plan to go ahead. The whole Sidewalk process has been shrouded in confidentiality agreements, and this has not engendered trust with folks like me, not to mention Council members, who try to keep tabs on what is happening. It is a classic problem of public-private partnerships where all critical debate and decisions happen behind closed doors beyond the ability of anyone outside an inner circle to review. How much has actually been committed is impossible to know. Sidewalk may have been told “if you want to do X, then you will need dispensation Y”. What we do not know is whether those dispensations are simply for discussion or have the active support of staff and politicians in the various governments. Sidewalk’s position is further undermined when they reveal that they view problems with public perceptions to be related to the narrow issue of technology use and control [see Oved]. The broader implications of a runaway development scheme cooked up behind closed doors are not mentioned. Implications of widespread information technology presence are understood by a relatively small group, but questions of “done deals” and influence in high places are political issues everyone understands. The entire proposal contains many sweeteners including sustainability, support for the emerging industry of wood buildings, and supposed improvements in the infrastructure of delivering services to a community. These may offset concerns about invasive technology, but are all of these simply a smokescreen for a much bigger grab for control of the Port Lands? The ink was barely dry on the Oved story when David Rider reported that a source at Queen’s Park told the Star’s Robert Benzie that the plan “had no chance of proceeding”. “There is no way on God’s green earth that Premier Doug Ford would ever sign off on handing away nearly 500 acres of prime waterfront property to a foreign multinational company that has been unable to reassure citizens their privacy and data would be protected,” confided the high-ranking Progressive Conservative insider. All public agencies and officials involved in this project need to go on record about their knowledge of and support for the Sidewalk proposal. This is not the time for bromides about the wonders of new technology and much-needed development. If we are giving away control of the waterfront, it’s time we all knew what is going on. This article is based on the public presentation held on September 18, 2017 at Harbourfront Centre. A similar presentation will be held in southern Etobicoke on September 26. The “Waterfront Transit Reset” project was launched by Council at the end of 2015 to review all of the outstanding plans for transit from the Mississauga border to Woodbine Avenue. The first phase of this review reported in July 2016, and that provided the springboard for Phase 2 which will report to Executive Committee on October 24, and thence to Council at its meeting beginning on November 7. The presentation was done west to east, and in a single go without questions. This was something of a marathon for the audience, and I am not sure this was the best approach given the complexity of issues in some areas. As someone who has followed the detail of this study since its inception and participated in consultation sessions, I am quite familiar with the issues and was just getting an update. Those who came to this fresh, as many did, had a lot to take in. A further problem is that the presentation included no cost estimates, and limited information on issues such as construction effects and complexity that could inform a choice between alternatives. This is particularly true of the review of Union Station. There are no travel time estimates to show what time savings, if any, various options present. Such estimates must exist as they are a critical input to the demand modelling process. For this article, I will take a different approach and deal with the simpler parts of the study first just to get them out of the way, leaving the knottiest problems to the end. The presentation file is now available as a PDF. The display boards can be viewed on the project website. The heart of any transportation study is the demand projection for various components under review. The chart below shows the 2041 AM peak hour demands forecast by the City’s planning model. There is a fundamental difference between the projected demands from the western part of the line and the eastern one. From the west, the demand has the conventional inbound-to-core pattern for the AM peak. At the core and to the east, the peak flow is outbound, south to Queens Quay and east to new office and school developments. It assumes the presence of the Bremner link although this is the least likely to be built beyond an upgraded bus service. There is no screenline west of Bay Street to indicate the demand arriving and leaving to the west right at the portal. With 2,350 going east and 3,700 coming south, this implies a substantial outbound demand to the west. Without the 750 each way on Bremner, these numbers would be higher. The comment about higher demand in the east without the Relief Line does not explain whether the modelled values shown here include that line or not. It is impossible to evaluate the demand numbers when there is no sense of staging of projects or of networks with some pieces “in” or “out” of the mix. There is also no sense of the time frame over which the various demands will evolve, only that this is the 2041 end state. Any decision of the order of projects (and indeed their worth relative to other parts of the transit network) must be in the context of changes that are anticipated in the short, medium and long terms. This also begs the question of whether there are changes in the pipeline that will require heroic efforts in building up transit service to avoid short changing growing parts of the city (much as we already see in Liberty Village). Another factor in any plans for the Waterfront network is the degree to which it serves major entertainment and recreational destinations. 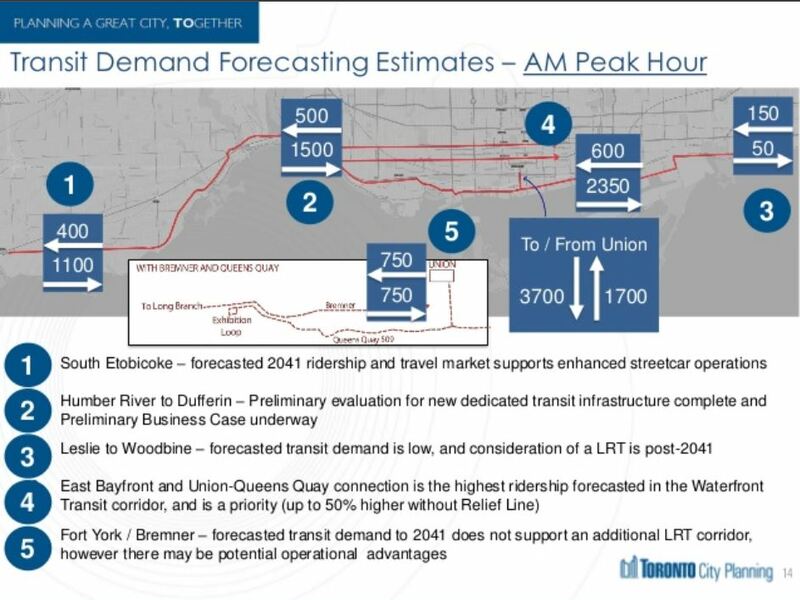 This will bring substantially stronger off-peak and seasonal demands that would be found on the transit network as a whole. Ridership growth on the TTC has been stronger during the off peak period, if only because there has been so little growth in peak service. Strong off-peak demand is good for transit economics because the fixed cost of infrastructure is spread over more hours and riders, but the flip side is that peak riders have more incentive to abandon the TTC. My apologies to readers for not posting this sooner. 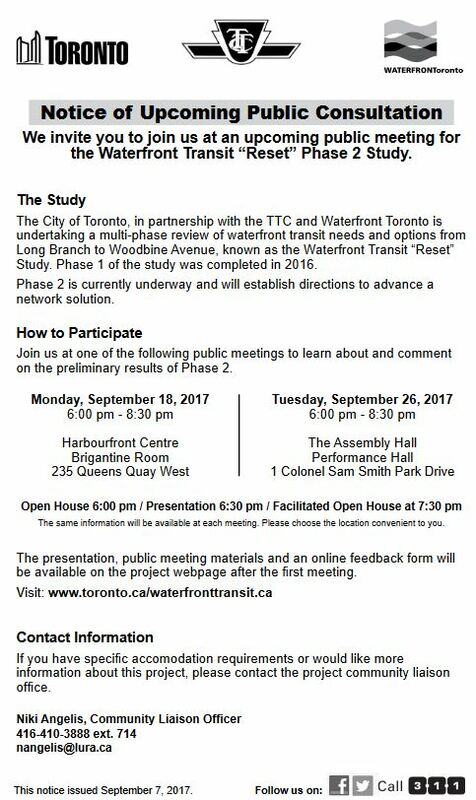 Waterfront Toronto, the TTC and the City of Toronto are holding two meetings to present the results of work on the “Waterfront Reset” project, a review of the various waterfront transit plans. After the September 18 meeting, I will post a commentary on the proposals. On Tuesday, September 12, 2017, the TTC began operation of its new Flexity streetcars with pantograph power collection on the 509 Harbourfront route. This is a short, comparatively isolated route running entirely with Flexitys where problems, if any, can be ironed out on a small piece of the network. Any off route moves including carhouse trips are done with trolley poles, and the normal changeover point between modes is at Exhibition Loop. Here is a small set of photos of the route. Looking W from Spadina to the crossover at the Music Garden. EB on Queens Quay at HTO Park. Overhead frog showing the skate to take pantographs under the frog. Pantograph passing under a frog. Trolley pole passing under a crossing frog. Pantograph passing under a crossing frog.